Flat UPVC Plastic Soffit / flat board / General purpose board. Use as soffits under the eaves of your roof or as a general purpose flat board, use 30mm Pins to fix or an edge channel if you wish to avoid pins showing. Description 100mm Black Ash 9mm UPVC 5m Soffit / flat board / General purpose board. Use as soffits under the eaves of your roof or as a general purpose flat board, use 30mm Pins to fix or an edge channel if you wish to avoid pins showing. Colour: Black Ash Dimensions: .. Description 150mm Black Ash 9mm UPVC 5m Flatboard / Soffit / General purpose board. Use as soffits under the eaves of your roof or as a general purpose flat board, use 30mm Pins to fix or an edge channel if you wish to avoid pins showing. Colour: Black Ash Dimensi.. Description 175mm Blackash finish 9mm uPVC 5m Flatboard / Soffit / General purpose board. Use as soffits under the eaves of your roof or as a general purpose flat board, use 30mm Pins to fix or an edge channel if you wish to avoid pins showing. Colour: Black Ash Dimensi.. Description 200mm Black Ash 9mm Upvc 5m Faltboard / Soffit / General purpose board. Use as soffits under the eaves of your roof or as a general purpose flat board, use 30mm Pins to fix or an edge channel if you wish to avoid pins showing. Colour: Black Ash Dimensions: .. Description 225mm Blackash 9mm uPVC 5m Flat board / Soffit / General purpose board. Use as soffits under the eaves of your roof or as a general purpose flat board, use 30mm Pins to fix or an edge channel if you wish to avoid pins showing. Colour: Black Ash Dimensions: 9mm x.. Description 250mm Blackash finish 9mm uPVC 5m Flat board / Soffit / General purpose board. Use as soffits under the eaves of your roof or as a general purpose flat board, use 30mm Pins to fix or an edge channel if you wish to avoid pins showing. Colour: Black Ash Dimensions:.. Description 300mm Black Ash 9mm UPVC 5m Soffit / flat board / General purpose board. Use as soffits under the eaves of your roof or as a general purpose flat board, use 30mm Pins to fix or an edge channel if you wish to avoid pins showing. Colour: Black Ash Dimensions: .. Description 400mm Black Ash 9mm UPVC 5m Soffit / flat board / General purpose board. Use as soffits under the eaves of your roof or as a general purpose flat board, use 30mm Pins to fix or an edge channel if you wish to avoid pins showing. Colour: Black Ash Dimensions: .. Description: 300mm Black Ash Finish, 3 plank T&G Hollow Soffit Black Ash Hollow Soffit : T & G Hollow Soffit in 5m lengths. Because of its attractive panelled effect and easy to install friendly tongue and groove system profile, hollow soffit is a favourite with installers an.. Description: Stainless steel black headed nails for 9mm Soffit uPVC plastic boards average contents 100 pins .. Description: Stainless steel black headed nails for 9mm Soffit uPVC plastic boards average contents 200 pins .. Description Stainless steel black headed nails for 9mm Soffit uPVC plastic boards - Black Ash or Plain Black average contents 250 pins .. Description: 300mm T&G Hollow Plain Black Soffit Plain Black Hollow Soffit : T & G Hollow Soffit in 5m lengths. Because of its attractive panelled effect and easy to install friendly tongue and groove system profile, hollow soffit is a favourite with installers and home-owners al.. 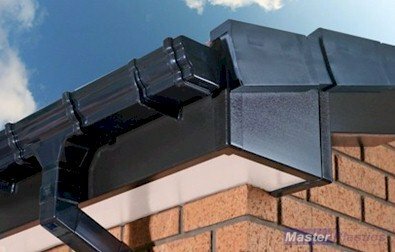 Product Length: 5m Accreditations: BSI Approved Guarantees: 10 Years Product Type: uPVC Black Ash Soffit J-Trim .. Manufacturer: Homeline Product Length: 5m Accreditations: BSI Approved Guarantees:1 0 years Product Type: uPVC Black Ash Soffit H- Trim .. Description: 68mm round soffit vents Black Dimensions: 68mm diameter .. Description: Gable Finial Black Ash ..
450 Builders Silicone is a premium quality low modulus non-corrosive neutral cure silicone sealant that adheres to virtually all substrates, both porous and non-porous. Typically used for construction expansion joints and perimeter pointing of all types of door and window frames. Conforms to I..